Regardless of whether you work inside or outside of the home, everyone has something that keeps them busy for at least 8 hours of the day. Being a parent adds even more time to that figure. How many people have you heard actually say, “I love grocery shopping”? It’s pretty much a time-consuming task for anyone. I used to think it was difficult shopping with a baby. Then I discovered it was a whole lot worse shopping with a toddler. If you are shopping with more than one child, your annoyance factor goes up exponentially by the number of children you have. Here are some of my favourite tips to ease the stress of grocery shopping and save a few bucks too! 1. Invest in a deep freezer. This allows you to stock up and save money when meat goes on sale. 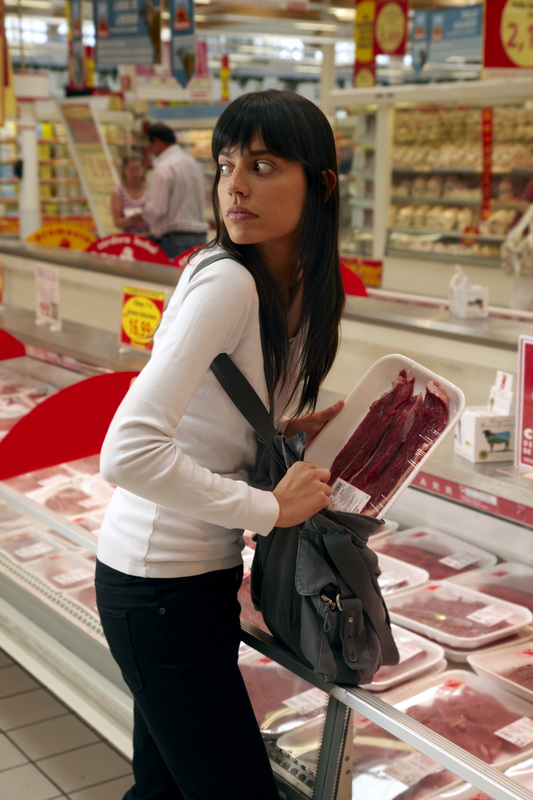 Did you know that meat is one of the most shoplifted items in the world? No one should resort to crime in order to have their favourite meal. It’s also cheap, fast and easy to whip up a meal when you already have the main ingredient on hand. I can assure you, this is not a photo of me. I would never steal, nor would I ruin a perfectly good purse with a dripping meat package. 2. Know your favourite brands. Everything goes on sale, so it’s all about the timing. When your favourite non perishable items go on sale, make sure you stock up. Like almost anything in the world, you can Google it, eg. “where is toilet paper on sale + toronto”. If you can obtain coupons for those products, you can significantly reduce the cost. This is easily done by “liking” the product on Facebook, signing up for email updates on the product’s website, or by calling the toll-free number printed on the product package and providing a comment. These are the easiest ways to receive high-value coupons without ever having to reach for scissors to clip them. Your friends and family can help you stretch your grocery dollars. Trust me, the people closest to you will want to help you out. The money you save can improve the quality of their birthday/Christmas gifts! When I needed diapers for my kids, I told everyone that I needed extra coupons for Pampers or Huggies. As a result, I had my family and co-workers clipping coupons for me. I have no qualms about asking anyone in my network to pick up a sale item for me if they happen to be going to a particular store and I’ve done the same in return. I’ve also bought in bulk quantities and shared the product and cost. This can easily be done with large sacks of flour, dried beans, or items that are bundled in multi-packs–pretty much anything from Costco. Who has that much storage space anyway? You know those times when you don’t feel like going anywhere or doing anything, eg. Saturday mornings, weekday evenings? The rest of the world feels exactly the same way, and that’s when I force myself to go grocery shopping. You’d be amazed at how quickly you can get the shopping done when you’re not concerned about finding a parking spot or trying to manoeuvre your cart in the store. I circle my flyers when I receive them on Thursday nights. Then I do the majority of my shopping at Walmart Supercentre, where they honour the sale prices of their major competitors, when you show the flyer at the checkout. They override the scanned price at the cash register without any hassle and also accept coupons on top of the sale price. This could result in an “overage” situation, where they pay you the difference if your coupon value is higher than the price of the item. This is not as far-fetched as it sounds. Extreme couponing, here we come! Although No Frills also offers price matching, I prefer Walmart because they offer free bags and they pack them for you. My sincerest apologies to the environment, but it’s pretty difficult to a) remember the re-usable bags that are in the trunk of the car, and b) bag the stuff while ensuring that your kids aren’t destroying the candy display at the checkout or running out of the store through the automatic doors. You can shop for groceries and toiletries online, at any time of the day. If you live in the Toronto area like I do, you can use Grocery Gateway. The food comes from Longo’s and they do offer sales, although the prices are not as low as the store flyer. You can even have a recurring shopping list for your frequently purchased items. The minimum order is $45 and the delivery cost is $9.95+tax. But how much is your time worth? Other Canadian online retailers include well.ca (free shipping over $29) and Walmart.ca, where free shipping is provided to the store’s Grab & Go lockers, and also directly to your home for orders over $50. Loblaws is also offering an online shopping option called Click & Collect. You can place an order online and schedule a pickup time, after someone has selected and packed your groceries for you. The minimum order is $30, with the pickup fee ranging between $3-$5.